Read on to share the fun – but be warned, it gets emotional! The Furchester Hotel starts on CBeebies on Friday 26th September at 5pm. Alex Winters: Have you enjoyed the morning? Elmo: NO! Only kidding, of course we have! Alex: How have you enjoyed coming to Britain to visit The Furchester Hotel, Elmo and Cookie Monster? Elmo: It was lots of fun, I got to meet Phoebe, and we became very close, we’re very tight now. And Elmo learned a lot. Cookie Monster: Me happy just to get the invitation! AW: How do the cookies compare to American cookies? Cookie Monster: A terrific question! They…pretty much equal! Cookie Monster: Yeah, you know, me not have to change me name to Biscuit Monster…that a good thing! Actually not bad though, Biscuit Monster! Alex: Have you tried malted milk? Cookie Monster: Of course! And digestives, me love ‘em! Alex: Dip them in hot chocolate, that’s my new thing. Cookie Monster: Oooooooh! Me have some in lobby? Elmo: That’s a good tip! Q1: Does Elmo like cookies? Cookie Monster: Me love that question! Q2: My name’s Ruby. Does the blue one [Furgus] like cookies? Furgus Fuzz: I’m partial to shortbread myself. Or ginger biscuits. Alex: Mmm, a Scottish biscuit! Funella Furchester: Ginger biscuits are lovely dunked in milk. Q2: Who’s been your naughtiest and untidiest guest? Funella: We have so many guests! All: Super Rock, he was very naughty! Funella: No, he was super…Super Rock was super. Furgus: Ooh, howling wolves in the middle of the night! Funella: Yes, that was a problem, we had some wolves staying and they kept all the other guests awake with their howling. That was a really big problem. Phoebe: It was a catastrophe. Q3: I’m Samuel. Does Cookie Monster eat any other food than just cookies? Cookie Monster: Mmmm, very smart question! Alex: You mean, does he have his five a day? Cookie Monster: Oh, me do! Me not ONLY eat cookies. Me like fruit and vegetables, me like meeeeat and veg, me like bicycle…me eat the canoe once….me not picky eater. But me LOVE cookies! Alex: Are you sure, Cookie Monster, because we only ever see you eat cookies…? Elmo: Elmo has seen him eat a Boeing 707 before. He was not messing around. Q4: Will there be any special guests in this series? Funella: Yes, and a porcupine. They’re all special, every guest at The Furchester Hotel is special. Q5: My name is Maya. What’s Elmo’s favourite colour? 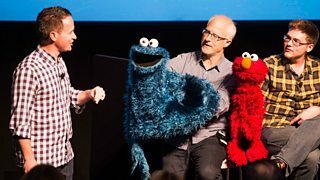 Alex: Elmo’s going to carry on naming all the colours…. Q6: Can I come and stay at The Furchester Hotel? Funella: Oooh, that is the nicest thing anyone’s said. A lot of people don’t come back…but that is so nice of you! We’d love to have you! Alex: Are you sure you want to go and stay at The Furchester Hotel? Elmo: We have a bowling alley. Just saying! Phoebe: We have a skate park! Q7: How much would it cost me for a family of four, so, two adults, two children, and where I could get some special room rates? Q8 [from Rufus Hound]: The opportunity to ask the performers a question is just too strong! 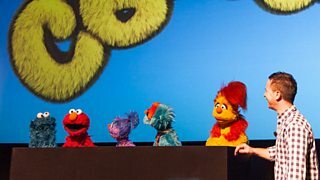 I’ve grown up thinking that Jim Henson was probably one of the greatest human beings ever to be alive, and I just thought I would take this opportunity to ask the performers whether the, sort of, shadow of what he set up in terms of the Children’s Television Workshop is still part of your lives or part of this process – or has that time moved on, are we in a different world now? 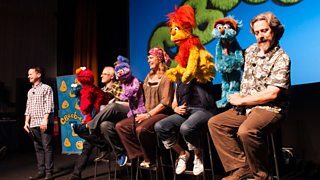 Louise Gold (Furnella): His legacy – David (Rudman, Cookie Monster) and I were lucky enough to work with Jim a lot and he was inspirational, he was fantastic – and his love and the feelings we had as a family is through all this stuff, it infects it. 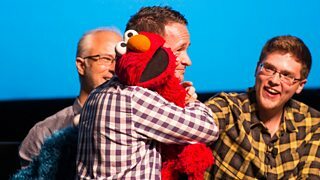 Ryan Dillon (Elmo): I think it’s kind of nice that it’s the one link that we all have. I never met him, but I think of him every day – it is THE reason I’m doing this. So, it’s pretty special. I think we all have that in common. Ryan: That’s the cool thing, even if you didn’t get to work with him you kind of feel like you did because of that family, there’s people who’ve been there. Rufus: What was it like actually working with him? What was he like? David: He was amazing to work with, he was a really good guide, and a really good teacher because he never really told you what to do, he would let you figure it out on your own. He never said ‘do it this way’, it was always ‘how do you feel you should do it?’ – which really helped you to learn how to do this. He was a genius. He had an amazing vision too. Louise: He loved the talent of everyone around him, he so enjoyed everyone’s work. David: Everyone felt free to contribute, no matter who you were on the set – and everyone loved coming to work. Alex: So, how many grown-ups here feel slightly emotional? I’ll only say that here, but I do feel slightly emotional. Alex: This is my dream! Elmo: Don’t cry, don’t cry! Q9: Do you like The Furchester Hotel, Elmo? Do you think you’ll come back to visit again? Elmo: If they’ll have me, sure! Elmo loves it – it’s such a fun place. It’s very different from Sesame Street, very different, but Elmo’s got lots of jobs here, and Elmo learns a lot. Alex: I’d love to go and stay. Do you do family rooms with a cot bed? Funella: Everything, we do everything! Are you and your little ones looking forward to The Furchester Hotel opening its doors on CBeebies? Join the conversation on the CBeebies Grown-ups Facebook or Twitter pages.